WASHINGTON, D.C. -- After reaching its 2016 low point two weeks ago, Gallup's U.S. Economic Confidence Index edged up to -12 for the week ending April 17. While the change from -14 to -12 is not statistically significant, it is a positive sign that Americans' confidence in the economy did not get any worse. 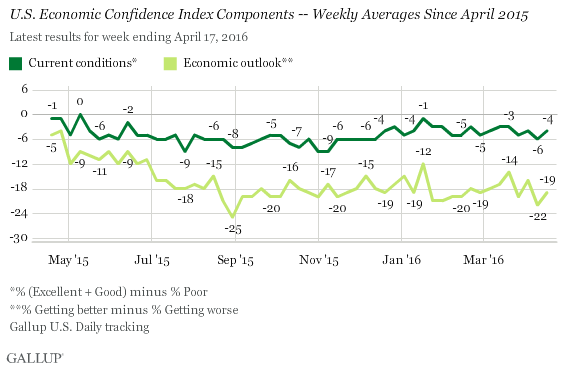 Americans' confidence in the U.S. economy has generally stabilized after a turbulent few days in early April. The index average of -14 for the week ending April 10 was slightly lower because of daily index ratings of -18 in the middle of that week amid volatility in the U.S. stock market. 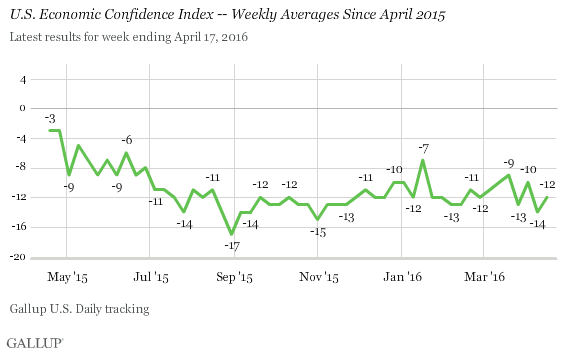 By April 8-10, confidence was back to -12 and has stayed near that level in the days since. The latest score is close to the average of -11 so far this year, and the 2016 weekly averages have held within a five-point range of -9 to -14, with the exception of a -7 reading in January. For the week ending April 17, the current conditions score of -4 stems from 25% of U.S. adults rating the current economy as "excellent" or "good," and 29% rating it "poor." The economic outlook score is now at -19 -- the result of 38% of U.S. adults saying the economy is "getting better" and 57% saying it is "getting worse." Both components of the index are statistically similar to the prior week's scores. While the Gallup U.S. Economic Confidence Index did not significantly improve last week, it at least retreated slightly from lower daily readings of -18 during the previous week. Some reasons attitudes might have stabilized could include the stock market's upward trajectory throughout the week and slightly lower gas prices. Still, Americans continue to hold a more negative view of the nation's economy. Even as low gas prices and a rising Dow Jones industrial average leave more money in people's pockets, other indicators -- particularly falling retail sales and profits -- could unnerve those watching the economy's progress. Results for this Gallup poll are based on telephone interviews conducted April 11-17, 2016, on the Gallup U.S. Daily survey, with a random sample of 3,537 adults, aged 18 and older, living in all 50 U.S. states and the District of Columbia. For results based on the total sample of national adults, the margin of sampling error is ±2 percentage points at the 95% confidence level. All reported margins of sampling error include computed design effects for weighting. Half of Americans have confidence in President Obama to recommend the right thing for the economy, unchanged from last year. More express confidence in Obama than in Fed Chair Janet Yellen and congressional leaders from both parties. Of the five presidential candidates, Americans express the most confidence in Sen. Bernie Sanders (47%) and Gov. John Kasich (46%) to recommend the right thing for the economy. Americans have the least confidence in Donald Trump (30%).